Here’s a look at the technology inside our M3 Smart Modules and custom integrated motion solutions. Patented piezoelectric UTAF motors and NSD2101 motor drivers power our M3 smart stages: linear micro stages and rotary micro stages. NOTE: UTAF motors are an enabling technology, available only within an M3 Module or custom solution. 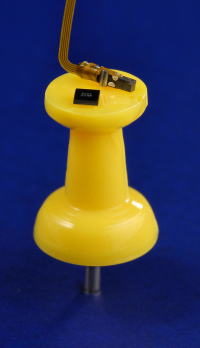 New Scale’s patented UTAF™ ultra-thin actuator family integrates all ultrasonic motor functions into a single piezoelectric ceramic beam measuring only 4.5 X 0.82 X 0.7 mm. It can produce either linear or rotary motion. This technology is used in New Scale motion modules and is available for licensing in high-volume applications. The UTAF motor uses an innovative co-fired multi-layer ceramic process to create a single beam composed of many thin layers of piezoelectric ceramic material. Sub-segments of the monolithic beam are energized independently, causing the beam to vibrate simultaneously in two orthogonal directions. The vibrations are used to move an object – such as a lens – placed in direct friction contact with the beam. UTAF motors can be used to produce either linear or rotary motion. Frequency, phase and amplitude of the ultrasonic vibrations are controlled by a two-phase drive circuit. Patented Smart Step control algorithms optimize speed and accuracy. Because the layers are very thin, they respond to signals of 3 volts or less. This allows the UTAF motor to operate directly from a portable device’s battery. New Scale combines UTAF technology with numerous other innovations to deliver complete “smart” actuator modules and microstages. These innovations include advanced drive electronics and motor control algorithms, high-efficiency pin-bushing guides and precision bearings, and innovative position sensor technology. All drive electronics are in the module – you just provide 3.3V and simple, high-level motion commands over a standard serial interface. Rotary applications include a Risley device designed for an endoscopic laser scalpel, and a very compact micro-mirror positioning system. 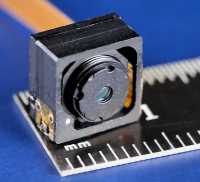 Linear applications include an Ultra-Thin Auto Focus module for micro camera systems. Patented ultra-thin UTAF motor with drive IC. Ultrasonic vibrations of the UTAF motor cause a frictionally-coupled object to rotate. Rotary mirror module with UTAF actuator and integrated drive electronics enables mirror rotation of +/- 20°. Linear lens focus module with UTAF actuator and integrated drive electronics enables faster focus and continuous autofocus in thin cameras. UTAF actuators rotate optics in a Risley device, an extremely compact and precise beam steering module with integrated drive electronics.